Is the future of wearables an icebreaker jacket, NFC handbag and haptic gloves? There's no question wearables are in their experimentation phase and a group of 15 students at Queen Mary's, University of London is stretching the definition of the category with their inventive prototypes. 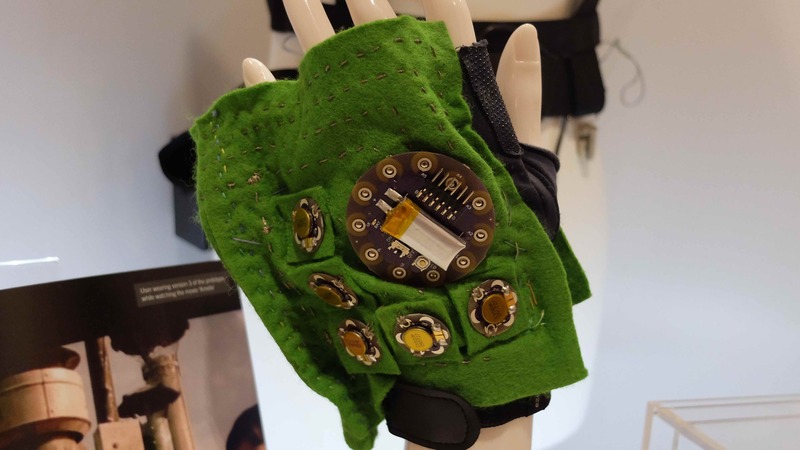 From a handbag that knows you haven't packed your keys to a jacket that helps you make new friends, some of this exciting work was debuted at the Wearable Technology Show 2015 in London. The majority of the students are completing PhDs in a range of fields from Cognitive Science and Electromagnetics to Media & Arts Technology. The key to all the projects, according to Dr. Akram Alomainy, Wearable Technology Research Lead at Queen Mary's, is simple - "creativity". The most popular piece of wearable tech on the Queen Mary's stand has been the Message Bag, said Alomainy. It's a smart bag system that's one of the best uses of NFC tags we've seen yet. Attach up to five coloured tags to essential items such as keys, purse, your phone, Oyster card and ID. Then when you leave your house in the morning, a line of LEDs on the front of the bag lets you know at a glance which items are inside the bag and which you've forgotten, as per the colour. There's also a beep and vibration when tagged items are placed inside the handbag. Message Bag is the creation of Cognitive Science student Christine Farion who says: "The goal of the devices I'm creating will be that our bags can communicate to us what is inside. This eliminates constant checking, double checking and worrying if we will forget something." Popcorn, Fanta.. gloves? These vibrating gloves are the brainchild of Antonella Mazzoni who is enrolled in a Media & Arts Technology PhD. They're designed for people who are hearing impaired and want to enjoy movie soundtracks - captioning and sign language take care of dialogue but Mazzoni wants to add an experience of the music too. "Some deaf musicians say they experience music as vibrations they feel on the body while playing an instrument," said Mazzoni in her description of the project. "Two previous studies presented the design of a vibrating haptic chair but this research aims... to give the user freedom of movement." It's not just for the hearing impaired, the gloves can enhance the experience of music for anyone with normal hearing. The Distant Heart is the dramatic name for this piece of smart jewellery designed by Yulia Silina. The black and gold necklace itself is very dramatic - it's bigger than even standard costume jewellery. What makes it smart is that it can reveal the heartbeat of a loved one to the wearer. The heart beat data itself is shared via a dedicated Twitter account, which seems quite odd, but the aim of the project is noble enough: to fill "the emotional void when families, friends and loved ones move away from each other". We've seen a couple of wearable concepts that aim to bring social media into the real world and Nanda Khaorapapong's Icebreaker jacket v2.0 is another potential winner. Designed for networking events, freshers' weeks and so on, the aim of the jacket is to help shy people meet and interact with others who share the same interests as them. A hidden RFID system senses a handshaking gesture between two wearers of the Icebreaker jacket and accesses your social media profiles. Then heat sensitive paint on the 'social indicator badge' changes colours from black/purple (not so compatible) to yellow/orange (very compatible) depending on your preferences. Khaorapapong describes her project as "a study tool in using the 'natural' interface of technology to understand the behaviour of shy people when meeting with a stranger." A hidden camera in the prototype can also record the wearer's point of view, conversations and the facial expressions of the people you talk to. Another modern wearable hoping to address social anxiety is the LuminUs, a system that provides musicians with live feedback on their interactions with musicians they are collaborating or performing with. Simple accelerometers are used to track the movements of musicians and in motion feedback mode, a small, coloured lighting display indicates these movements to other musicians. In gaze feedback mode, the musicians wear eye-tracking headsets which indicate to others, again via the lighting strip, when one player is glancing at another. "The LuminUs specifically targets the inter-personal and social aspects of collaborative music making," said the engineer and designer Evan Morgan who completes his PhD in October. "We did it in a performance setting with the musicians improvising to a two minute animation," he told Wareable. "We're just looking at how they responded to having the technology on them. It looks like when they were using it and when it was lighting up, they would look at each other more."